Since I dyed my hair platinum blonde from the dark blonde it is naturally, I’ve spent a lot of time trying to find the best purple shampoo. When I first dye it platinum blonde, because of my natural hair colour it goes quite yellow, and so I need a good purple shampoo to tone down the brassiness. 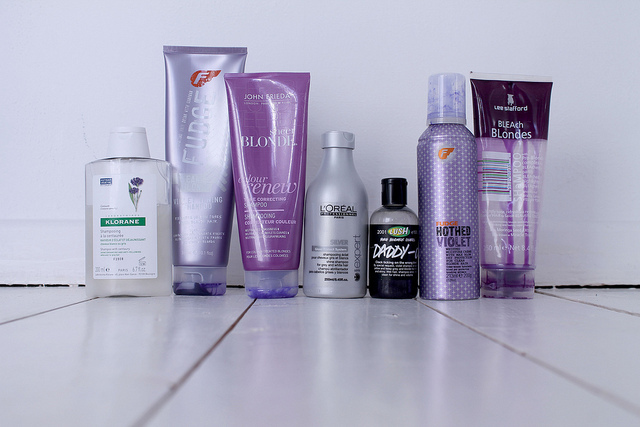 Finding the best purple shampoo for bleached hair has become quite a quest for me, and as there aren’t actually that many reviews out there I thought I’d write my own so I can save anyone searching for one a bit of time and money. There are a couple I haven’t tried yet – the Joico purple shampoo is next on my list – but here are some short reviews for the ones I have. Not strictly a purple shampoo, but this shampoo promises to ‘brighten and illuminate’ white or grey hair, and the reviews on Amazon say it’s effective for taking away yellowness. I found it difficult to lather and that it doesn’t brighten my hair – no noticeable difference really. This is my favourite of all the shampoos I have tried. It does give my hair a lilac-y tinge so if that’s not what you’re trying to achieve then maybe only use it once a week. If it is what you’re trying to achieve then leave it on for 5-10 minutes at a time and your hair will have a lovely, discreet purple hue. It smells amazing and leaves my hair feeling really soft. I didn’t see any difference when I used this shampoo. It seemed to be just a normal shampoo coloured purple rather than a toning shampoo as it doesn’t stay purple when on the hair. I’ve bought and rebought this many times, it’s almost on an equal par with the Fudge shampoo, you just get a bit less for your money! It was recommended to me by my hairdresser and it really does counteract the brassiness/yellowness you get when you bleach your hair. It doesn’t make your hair as purple as the Fudge shampoo, it makes it more silver so if that’s the effective you’re trying to achieve then this one’s for you. I love Lush and I really wanted to like this. It smells amazing (like Parma Violets!) and it does make my hair feel silky soft but I didn’t notice any difference in terms of counteracting brassiness or making my hair look whiter or brighter. I bought this after seeing rave reviews for it on Amazon. It’s not strictly a shampoo as it’s a mousse you put on to towel-dried hair but it really is so effective. It gives that lilac tinge and knocks out brassiness, a great little product. You can probably see from the photo that this was a favourite of mine and well-used up until I discovered the Fudge shampoo. I first bought it because I bleached my hair just before going away to Cornwall and I needed to dash into Boots and grab something – this is perfect if you need something immediately! If you’ve just bleached your hair and need an intensive treatment rather than a shampoo I’d also recommend Lee Stafford Hot Shots 4 Blondes which is really effective. So there we have it, my review of the best purple shampoo. If you want a purple tinge I’d recommend the Fudge Violet Shampoo (£8.95), if you’re just looking to knock out brassiness I’d recommend the Loreal Silver Shampoo (£8.99). Also, if you’re interested, I use Schwarzkopf LIVE Color XXL Absolute Platinum to bleach my hair. It’s the only one I’ve used but it works well so why change it? Have you ever used a purple shampoo? What’s your favourite?